Ensure federal infrastructure policies support the construction of resilient buildings. Support the Department of Energy’s (DOE’s) role in promoting healthy, energy-efficient homes and workplaces. Support federal policies that promote a legally admitted, foreign-born workforce for the construction industry. Congressman Adam Kinzinger—a Republican from the 16th district in Illinois who affirmed that infrastructure is going to be a priority in the coming year, and that he is working to modernize the DOE through his role in the Energy and Commerce Committee. He also said that it is important to update our worker visa program so that industries like ours have enough workers to staff projects. Alex Hergott—Associate Director of the White House Council on Environmental Quality, he discussed how most infrastructure projects are owned at the state and local level, and unfortunately can sometimes be passed over as there is competition for resources. He also explained that President Trump wants to use grant money to incentivize states to undertake infrastructure projects. Additionally, he shared how the approval and permits process can inhibit growth, and explained that streamlining this process is one of the administration’s priorities. Chad Moutray—the Chief Economist of the National Association of Manufacturers gave an update on the state of the economy, noting that the manufacturing sector and the global economy is doing well. He also explained that the primary concern across multiple insulation-related industries was how to attract and retain a quality workforce. Bruce Mehlman—an experienced lobbyist who gave an update on the current atmosphere on Capitol Hill, which he characterized as “disrupted” due to a combination of political and social factors. The panel was moderated by David Beam, the President and CEO of Insulate America, and NIA Consultant and Past President Ron King. The panel felt positive about the overall direction of the industry, but reiterated concerns about a dwindling workforce. They also discussed how automation and technological advances will play an increasingly large role in the industries, how insulation contractors can work together to become more involved in the spec process, the importance of codes, and OSHA enforcement and safety. 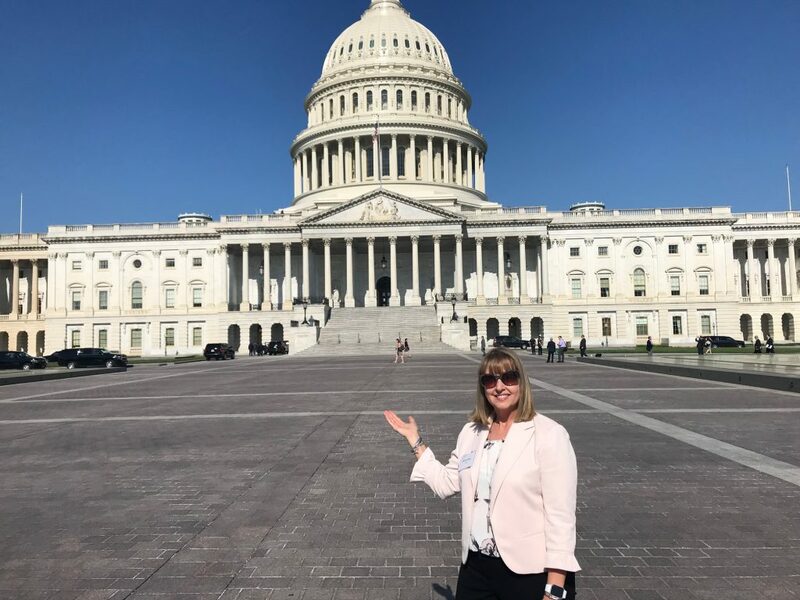 NIA EVP/CEO Michele Jones at the Capitol Building. During these meetings, we made a case for the outlined policy objectives and discussed how insulation’s benefits—energy and cost savings, reducing environmental impact, and stimulating the economy and creating jobs—can help the building industry and the country. Whether speaking with office staff or the Representatives or Senators themselves, the challenging environment on Capitol Hill was a frequent theme. There is certainly support for the policy objectives, but it will take an ongoing effort to see results. While midterm elections looming, there are unlikely to be substantive legislative accomplishments in the near future. Participating in this event helped to lay important groundwork for future progress. Showing how these issues affect Representatives’ and Senators’ congressional districts and states is a vital step in winning more support for our cause. We are excited to participate in this event next year, and are looking to involve more members. For Senators and Representatives, nothing is more motivating than hearing directly from constituents in their district of state. Increased member participation will play a huge role in moving these policy objectives forward.